· STIX™ Version 2.0. Part 1: STIX Core Concepts. Edited by Rich Piazza, John Wunder, and Bret Jordan. Latest version: http://docs.oasis-open.org/cti/stix/v2.0/stix-v2.0-part1-stix-core.html. · STIX™ Version 2.0. Part 2: STIX Objects. Edited by Rich Piazza, John Wunder, and Bret Jordan. 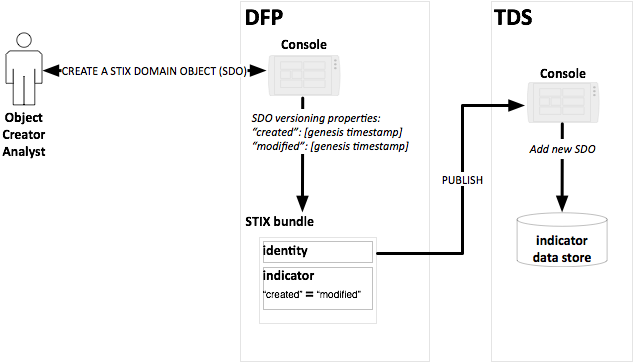 Latest version: http://docs.oasis-open.org/cti/stix/v2.0/stix-v2.0-part2-stix-objects.html. · STIX™ Version 2.0. Part 3: Cyber Observable Core Concepts. Edited by Ivan Kirillov and Trey Darley. Latest version: http://docs.oasis-open.org/cti/stix/v2.0/stix-v2.0-part3-cyber-observable-core.html. · STIX™ Version 2.0. Part 4: Cyber Observable Objects. Edited by Ivan Kirillov and Trey Darley. Latest version: http://docs.oasis-open.org/cti/stix/v2.0/stix-v2.0-part4-cyber-observable-objects.html. · STIX™ Version 2.0. Part 5: STIX Patterning. Edited by Ivan Kirillov and Trey Darley. Latest version: http://docs.oasis-open.org/cti/stix/v2.0/stix-v2.0-part5-stix-patterning.html. · TAXII™ Version 2.0. Edited by John Wunder, Mark Davidson, and Bret Jordan. Latest version: http://docs.oasis-open.org/cti/taxii/v2.0/taxii-v2.0.html. · STIX/TAXII™ 2.0 Interoperability Test Document: Part 2 Version 1.0. Edited by Allan Thomson and Jason Keirstead. Latest version: https://docs.oasis-open.org/cti/stix-taxii-2-interop-p2/v1.0/stix-taxii-2-interop-p2-v1.0.html. This is Part 1 of the Interoperability test document to supplement the five-part Structured Threat Information Expression (STIX) 2.0 specification developed by the Cyber Threat Intelligence Technical Committee (CTI TC) of the Organization for the Advancement of Structured Information Standards (OASIS). The is the first in a series that will be developed concurrent with revisions to the STIX specification. This test document provides detailed requirements on how producers of products within the threat intelligence ecosystem may demonstrate conformity with STIX 2.0 if they wish to self-certify that their software is verified as interoperable. There are six personas detailed in Part 1 of this specification. These are: Data Feed Provider (DFP), Threat Intelligence Platform (TIP), Threat Mitigation System (TMS), Threat Detection System (TDS), Security Incident and Event Management (SIEM), and Threat Intelligence Sink (TIS). This Interoperability test document defines tests of the following test cases: indicator sharing, sighting sharing, versioning, data markings, custom objects and properties, and course of action sharing. For each of these test cases the document details the Producer support and the Respondent support to be used for the test cases. This is a Non-Standards Track Work Product. The patent provisions of the OASIS IPR Policy do not apply. This document was last revised or approved by the OASIS Cyber Threat Intelligence (CTI) TC on the above date. The level of approval is also listed above. Check the "Latest version" location noted above for possible later revisions of this document. Technical Committee (TC) members should send comments on this document to the TC's email list. Others should send comments to the TC's public comment list, after subscribing to it by following the instructions at the "Send A Comment" button on the TC's web page at https://www.oasis-open.org/committees/cti/. STIX/TAXII™ 2.0 Interoperability Test Document: Part 1 Version 1.1. Edited by Allan Thomson and Jason Keirstead. 16 August 2018. OASIS Committee Note 01. https://docs.oasis-open.org/cti/stix-taxii-2-interop-p1/v1.1/cn01/stix-taxii-2-interop-p1-v1.1-cn01.html. Latest version: https://docs.oasis-open.org/cti/stix-taxii-2-interop-p1/v1.1/stix-taxii-2-interop-p1-v1.1.html. Copyright © OASIS Open 2018. All Rights Reserved. This document details Part 1 of the Structured Threat Information Expression (STIX) 2.0 Interoperability Test Documents. It defines a set of test cases that software products, categorized by persona, must implement to achieve STIXPreferred self-certification. The STIXPreferred certification uses the term persona throughout the test cases to represent a category of similar product capabilities in a security ecosystem. See Section 1.3.2 for a full list of all persona used. To claim STIXPreferred certification, implementations of one or more personas must adhere to expected behaviors and outcomes as detailed in the test cases. This document, Part 1, is the first in a series of documents designed to be modular, i.e. new documents will be created as additional test cases are developed. Subsequent documents will be created and numbered Part 2, Part 3, ...etc. Each test document will describe what personas and test cases are covered in that specific document version. The OASIS Cyber Threat Intelligence Technical Committee (CTI TC) recommends users of this test document become familiar with the STIX 2.0 Core Concepts, and STIX 2.0 Objects, and other supporting specifications (as given in the Related Work section above) prior to implementing the test cases in this document. An organization must submit the results for their specific tests to the OASIS CTI TC Interoperability Subcommittee to achieve confirmation of interoperability and to be listed on the OASIS website page showing the organization’s compliance to STIX 2.0. Further submittal instructions are found in Section 3 Persona Checklists. NOTE: The STIX & TAXII specifications contain normative references to other specifications with which an implementation may need to reference and meet in order to comply with these specifications. This document assumes that such requirements are also met. This specification is provided under the Non-Assertion Mode of the OASIS IPR Policy, the mode chosen when the Technical Committee was established. For information on whether any patents have been disclosed that may be essential to implementing this specification, and any offers of patent licensing terms, please refer to the Intellectual Property Rights section of the TC’s web page (https://www.oasis-open.org/committees/cti/ipr.php). Security Personnel - Any human being that is performing a security function within an organization including threat analysis; security operations; network operations, etc. Producer - A software instance that creates STIX 2.0 content to share with other systems. Respondent - A software instance that reads STIX 2.0 content and performs some action on that received data. The approach that is being taken within the CTI TC is to rely primarily on well-defined, common test cases to drive the demonstration of interoperability between products using STIX 2.0 and the Trusted Automated Exchange for Indicator Information (TAXII) version 2.0, also under development within the CTI TC. Section 2 of this document outlines these common test cases for organizations seeking to develop and demonstrate interoperability. These test cases will enable personas (defined herein) of the cyber threat intelligence information sharing community to build and test information sharing files that are compliant with STIX 2.0 best practices. Note that this document includes tests that mandate the presence of OPTIONAL STIX 2.0 object properties. These occurrences can be found in required producer persona support, as well as test cases. In these situations, producers must produce data containing these OPTIONAL properties in order to demonstrate interoperability compliance as defined in this document. Correspondingly, a respondent must properly process these OPTIONAL properties to demonstrate interoperability. The STIXPreferred personas shown in Figure 1 are used throughout this document. ○ Software instance that acts as a producer of STIX 2.0 content. ○ Software instance that acts as a Producer and/or Respondent of STIX 2.0 content primarily used to aggregate, refine and share intelligence with other machines or security personnel operating other security infrastructure. ○ Software instance that acts as a producer and/or Respondent of STIX 2.0 content. A SIEM aggregates events, incidents and indicators and may produce STIX content based on that security operations tasks associated with those activities. A SIEM that consumes STIX content will typically consume sightings and/or indicators. ○ Software instance such as a firewall or Intrusion Prevention System (IPS), Endpoint Detection and Response (EDR) software, etc. that acts on courses of action and other threat mitigations. ○ Software instance such as Intrusion Detection System (IDS), Endpoint Detection and Response (EDR) software, web proxy, etc. that monitors, detects and alerts. ● Software instance that consumes STIX 2.0 content in order to perform translations to domain specific formats consumable by enforcement and/or detection systems that do not natively support STIX 2.0. These consumers may or may not have the capability of reporting sightings. A TIS will typically consume intelligence identified in the STIX content but will not produce any STIX content itself. For an organization to receive OASIS STIXPreferred self-certification, the software instances must adhere to persona behavior and prescribed bundle contents as detailed in the Required Producer Persona/Profile Support section of each test case. For documenting self-certification for each persona tested, refer to the checklist and test requirements in Section 3 Persona Checklist of this document. The following Part 1 test cases are broken down into a common set of test cases for each of the defined persona. There are also a set of defined optional test cases for those persona that may choose to verify additional capabilities. The following test cases are defined in this document. The following sections provide details on these test cases. All test data must comply with the following set of additional requirements. a. All tests require the creation of an identity for the created_by_ref property across all tests. b. The Identity created should represent the organization that is responsible for the software instance under test. a. Throughout this test document this property is used to convey a human-readable reference to the Interoperability document that defines the required test content. b. Although this is a best practice to provide descriptive terms for all intelligence produced, it is not mandatory for any producer to generate and consume data that includes this property. One of the most common test cases that has emerged within enterprises tracking threat intelligence globally and/or within Information Sharing and Analysis Centers (ISACs) and Information Sharing and Analysis Organizations (ISAOs) has been the sharing of Indicators (sometimes referred to as Indicators of Compromise or IOCs) using a threat intelligence platform (TIP) that integrates one or multiple Data Feed Providers (DFPs). 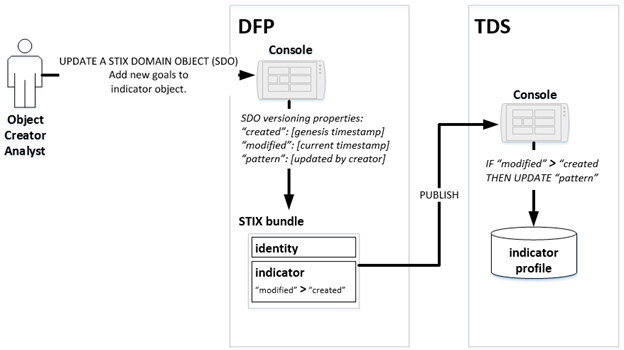 Indicators and other STIX data objects (SDOs), as defined in the STIX 2.0 Specification, may be shared via proprietary feeds, open source feeds and/or through a sharing community. The TIP is used to aggregate and process the data and then map it to the STIX 2.0 data model. Some TIPs also provide for data enrichment, analysis and indexing, visualization and bi-directional IOC sharing with other security products through application programming interfaces (APIs). The Respondents of the SDOs include both the personas documented in this Committee Note for machine readable threat intelligence (MRTI) and human analysts including, but not limited to: threat intelligence analysts, fraud and risk analysts, malware analysts, and network and endpoint guardians, among others. This high-level view is useful for illustrating how a test case (in this case, sharing of Indicator objects) and a persona will work together within this Committee Note for the purpose of interoperability demonstration. The following sections provide more detailed descriptions of how a STIX 2.0 Indicator object may be used for the purpose of demonstrating interoperability. A STIX 2.0 Indicator defines a pattern of STIX Cyber Observable values of interest (e.g. suspicious or malicious). . There are several common characteristics of data specified in test cases that will be verified. The TIP producer persona, shown on Figure 3 operated by the “Analyst”, has identified one or more Indicators that indicate malicious content on the Internet. That content may be an entity of interest to consider for monitoring activity. 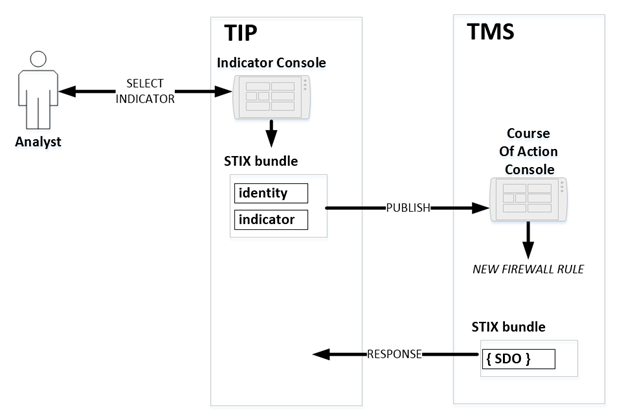 Also shown is how a TIP processes a STIX Bundle, and it illustrates how the information is published as a Bundle to a TMS, which then issues a response. The Producer persona must be able to create a STIX Bundle with one or more indicators such as IP Address v4; IP Address v6 for all Classless Inter-Domain Routing (CIDR) variations, and options. 1. Producer allows a user to select or specify the IP Address associated with Actor A and identify that Actor A’s IP address as an IOC to share to a Respondent persona. The following subsections provide the test case data for the test. Verify for all test cases that the objects defined in each test are produced either in a single bundle or across multiple bundles. "pattern": "[ipv4-addr:value ISSUBSET '198.51.100.0/24' OR ipv4-addr:value ISSUBSET '196.45.200.0/24']"
"pattern": "[url:value = 'https://www.5z8.info/foo' OR domain-name:value = 'www.5z8.info']"
"pattern": "[file:hashes. 'SHA-256' = 'bf07a7fbb825fc0aae7bf4a1177b2b31fcf8a3feeaf7092761e18c859ee52a9c' OR file:hashes.MD5 = 'cead3f77f6cda6ec00f57d76c9a6879f']"
The Respondent must be able to parse and display any Indicator that has been shared with IP Address information. 4. For each Indicator object, the TIP is able to display that the indicator fields contained in the pattern represents an IOC. 4. For each Indicator object, the Respondent is able to capture network information (packets or counts or flows) that the FileHash; IP; FQDN; URL contained in the pattern matched against. 5. Specifically, for the TMS persona, the TMS is able to block traffic based on the Indicator pattern matched within a packet sequence. 4. For each Indicator object, the SIEM is able to display and/or alert upon other relevant security information it has from other event log sources (firewalls, sensors). The SIEM is able to show the overlap of previously logged indicators and incoming indicator information including FileHash, IP, FQDN, and URL. The SIEM may generate sightings based on the indicators. This test case is primarily testing the production of an Indicator and a Respondent's ability to parse and represent and act on the Indicator data correctly. No other data is sent from the Respondent back to the Producer. Another important scenario that will provide for crowdsourcing in the context of a sharing community is the use of a Sighting STIX Relationship Object (SRO). This is a unique form of a relationship object that provides for the confirmation of a “sighting” of an Indicator SDO (as evidenced by specific Cyber Observable objects) by a third-party; that is, by an Identity separate from the original Producer of an Indicator SDO. The full power of the use of trust communities within the ISAC and/or ISAO context cannot be realized without the use of this SRO. Therefore, it is an important test case to demonstrate for STIX interoperability. A STIX 2.0 Sighting object is an SRO primarily used to capture documentation that some entity in the network has been seen by an intelligence source. The Producer persona, shown on Figure 4 as an “Analyst”, has selected one or more sightings observed by the supporting SIEM tool. 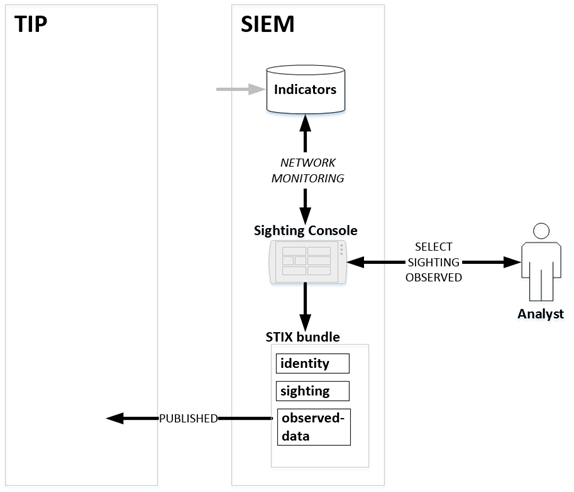 Consequently, the SIEM publishes a STIX Sighting Bundle and publishes it for various receiving personas. 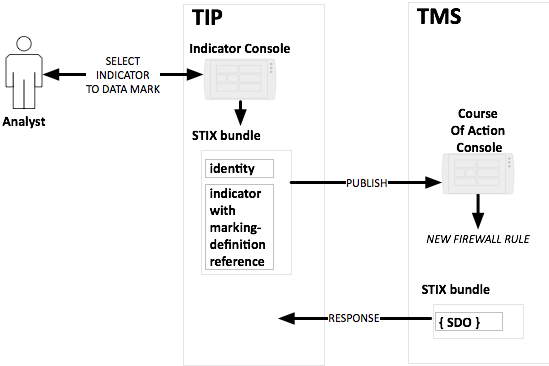 The Producer persona must be able to create a STIX Bundle with one or more Indicators as identified by the Indicator Sharing Producer Test Case Data. All personas defined in Required Producer Persona Support are also defined for Sighting Producer personas. Same as Indicator Sharing Producer Test Case Data. The Respondent must be able to parse and display any Indicator that has been shared as well as create a Sighting associated with the Indicator. 1. Respondent supports all Respondent required behavior for Indicator tests defined in Section 2.2.4. 2. Respondent allows the user to create or select a Sighting object observed and associated with each Indicator pattern identified in the Producer's Bundle. e. objects must match an Indicator pattern defined by the Producer. In addition to the verification steps shown in the above row for TIP; SIEM, the TMS SHALL provide evidence that it blocked the traffic identified by the patterns in the Indicator. In addition to the verification steps shown in the above row for TIP; SIEM the TDS SHALL show or provide statistics on how many packets or sessions matched the Indicator content. In addition to the verification steps shown in the above row for TIP; SIEM the TIS SHALL show or provide statistics on how many packets or sessions matched the Indicator content. The following subsections provide the test case data for the test. 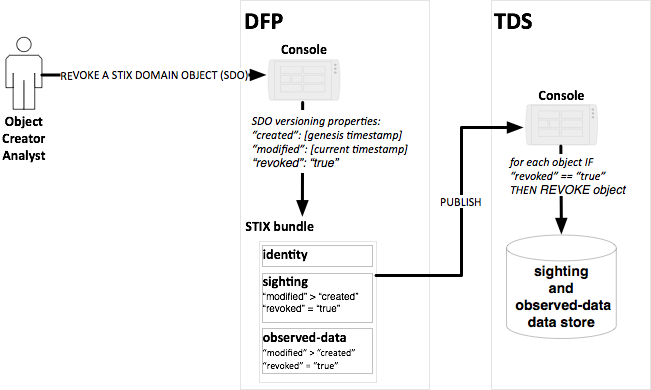 As additional information is discovered about an SDO, the Producer of that object may version the original object using the versioning approach outlined in Part 1 of the STIX 2.0 Specification. Other recipients of the SDO will also be updated through their various personas as the original SDO is versioned. This feature of the STIX 2.0 Specification allows for SDOs to be updated as the context changes and the information becomes more complete, based on enrichments and further intelligence discovery. A STIX 2.0 Producer or Respondent must support versioning of objects to support interoperability within STIX. The Producer persona must be able to create a STIX Bundle with one or more objects with the appropriate date representing when the object was created for sharing. The Producer persona has identified an STIX object that they wish to share to Respondents. NOTE: Not all personas defined in this spec create Indicators. 1. Producer allows a user to select or specify STIX content to create and send to a Respondent persona. 1. Producer allows a user to select or specify the STIX content to create and send to a Respondent persona. The Respondent must be able to parse and display the creation and modification date of the objects received. 4. For each Indicator, the Respondent may show the creation and modified dates for them. This test case is primarily testing the production of an Indicator; its related version information and a Respondent's ability to parse and represent the data correctly. No other data is sent from the Respondent back to the Producer. The Producer persona must be able to create a STIX Bundle with one or more objects with the appropriate date representing when the object was updated for sharing. The Producer persona has identified a STIX object that they wish to update and re-share to Respondents. 1. Producer allows a user to select a previously shared Indicator with IP Address associated with Actor A. 1. Producer allows selection or specification of the STIX content to send to a Respondent persona. "pattern": "[ipv4-addr:value = '198.51.100.1' OR ipv4-addr:value = '198.51.100.2']"
The Respondent must be able to parse and display the creation; modification dates as well as the changed field of the objects received. 4. For each Sighting, the Respondent may show the creation and modified dates for them. The Producer persona must be able to create a STIX Bundle with one or more objects with the appropriate date representing when the object was revoked for sharing. The producer persona has identified a STIX object that they wish to update as revoked and re-share to Respondents. 1. Producer allows a user to select a previously shared Indicator that is no longer valid and wishes to delete that Indicator. iii. modified must match the last modified timestamp to millisecond granularity of when the user updated the indicator to be revoked. iv. revoked must be set to true. 1. Producer allows a user to select a previously shared Sighting (and associated observed data) that is no longer valid and wishes to delete that sighting. iii. modified must match the last modified timestamp to millisecond granularity of when the user updated the Sighting to be revoked when the revoked property was set to true. iii. modified must match the last modified timestamp to millisecond granularity of when the user updated the observed_data to be revoked. The Respondent must be able to parse and display the creation; modification dates and revoked field of the objects received. 4. For each Sighting, the Respondent may show the creation and modified dates for them and that the object has been revoked. This test case is primarily testing the production of an Indicator or Sighting, its related version information, and a Respondent's ability to parse and represent the data correctly. No other data is sent from the Respondent back to the producer. A STIX 2.0 Producer or Respondent must support markings applied to objects and the related operations around them. The Data Markings test cases focus on how markings should be represented. How consumers mitigate markings and their related Indicator(s) is not prescribed in this specification. Data Markings can be produced at an object level and at an attribute level. Data Markings at the attribute level are known as granular markings. This section describes basic tests for assigning Data Markings to shared data using the traffic light protocol (TLP). “TLP is a set of designations used to ensure that sensitive information is shared with the appropriate audience.” It is defined by a Forum of Incident Response and Security Teams (FIRST) Special Interest Group (SIG). For these test cases, STIX TLP data markings must be accompanied by at least one Indicator. 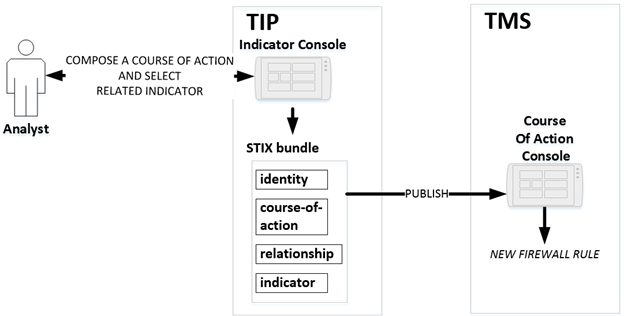 The producer persona must be able to create a STIX bundle with one or more Indicators as identified by the Indicator Sharing Producer Test Case Data. All personas defined in Indicator Sharing Required Producer Persona Support are also defined for Data Markings producer personas. Producers should allow users to create marking-definitions and apply object level markings to an SDO or SRO at all TLP levels. 1. Producer allows a user or an administrator to apply object level markings to a variety of Indicators that are being shared. 2. Producer may provide TLP object level markings at any level. a. Producer verifies that objects to be marked do exist in the bundle. b. Producer must NOT mark Indicator objects with more than one TLP level markings. a. For different objects, the user can apply different TLP levels including: tlp “green”; tlp “amber”; tlp “red”; tlp “white”. 4. The SDO object_marking_refs list of marking-definition is populated with markings created by Producer and the id that matches the intended TLP marking. The following subsections provide the test case data for the test. In all cases the data markings referenced by the other objects in the content are using the TLP predefined constants. The Respondent must be able to parse and display any Indicator that has been shared with IP Address information and data markings, if present. All required Respondent support defined in 2.2.4 Required Respondent Support also applies to Data Markings. 4. For each set of objects, the Respondent must display or filter the objects based on the associated Data Markings applied to that object. This ensures that the user accessing the set of objects has appropriate marking authorization for TLP green, TLP amber, TLP red and TLP white depending on the test case performed. If an organization produces or consumes custom STIX objects or properties, the following tests verify that the capability is done correctly. NOTE: Not all personas defined in this specification create Indicators. 1. Producer allows a user to select or specify the STIX custom object content to send to a Respondent persona. 1. Producer allows a user to select or specify the STIX SDO object content to send to a Respondent persona including the custom property associated with the SDO. A Respondent receiving custom objects or properties must conform to the following tests. 3. For each custom object, the Respondent must be able to determine that it is a custom object and not a SDO and can verify that the created_by_ref maps to an existing Identity received or one contained within the bundle received. 5. If the Respondent supports the custom object, then for each custom object, the Respondent may show the creation and modified dates for them. If the Respondent does not support the custom object, then the Respondent’s console should be able to continue servicing the user without crashing, and support remaining SDOs in the Bundle. 3. For each SDO the Respondent must be able to determine that it is a SDO and able to ingest/parse all mandatory fields. 4. If the Respondent supports the custom property, then they may show or use the custom property included in the SDO. 5. If the Respondent does not support the custom property, then the Respondent may discard or show to the user that the SDO has been rejected. The Respondent’s console should be able to continue servicing the user without crashing, and support remaining SDOs in the Bundle. This test case is primarily testing the production of custom objects, its related core property information, and a Respondent's ability to parse and ingest (not reject) all content that may be bundled with SDOs. No data is sent from the Respondent back to the Producer. A Course of Action (COA) is a recommendation to respond to some form of threat. Typically, a COA would be created as a separate object that is then connected to other intelligence objects that, when detected, can be mitigated by the playbook sequencing called by the COA object. However, the COA object in STIX 2.0 is a stub. It is included to support basic test cases (such as sharing prose courses of action) but, at this time, it does not support the ability to represent automated courses of action or contain properties to represent metadata about courses of action. The COA SDO primarily focuses on a textual description of the mitigating action. The Producer must be able to populate the ‘name’ and ‘description’ with the textual information for the mitigating action to perform. 1. Producer allows a user to select or specify the STIX content to send to a Respondent persona. iv) description that provides more details and context about the course-of-action, potentially including its purpose and its key characteristics. The Respondent must be able to parse and display all COA Properties. 4. For each course-of-action object the Respondent is able to display the information from the course-of-action fields to the user. The following checklists summarize all tests that a persona (Producer or Respondent) must conform to within that persona. An organization must submit the results for their specific persona(s) to the OASIS CTI TC Interoperability SC to achieve confirmation of interoperability and to be listed on the OASIS website page showing the organization’s compliance to STIX 2.0. Results must be submitted to the STIX Interoperability sub-committee for verification. Results may be submitted as separate logs; documents; screenshots; any other proof such that the reviewers can assess whether the organization has confirmed compliance to STIX 2.0 interoperability tests for their specific instance. 2) For each test, add a reference in the results column on what evidence documentation supports compliance results. 3) Submit both the filled in section and all supporting documentation. 3. Summary of the references that substantiate interoperability conformance. No independent testing will be performed directly by the Interoperability SC; rather the verification process will confirm that the documentation is complete and accurate as claimed by the submitting party. For the purpose of this document a DFP is a software instance that acts as a Producer of STIX 2.0 content. Any instance being qualified as a DFP must confirm test results for the following test cases. For the purpose of this document a TIP is defined as a software instance that acts as a Producer and/or Respondent of STIX 2.0 content primarily used to aggregate, refine and share intelligence with other machines or security personnel operating other security infrastructure. Any instance being qualified as a TIP must confirm test results for the following test cases. For the purpose of this document a SIEM is a software instance that acts as a Producer and/or Respondent of STIX 2.0 content. The primary Respondent role of a SIEM is report Indicators and other high-level information. The Producer SIEM primarily reports Indicators. Any instance being qualified as a SIEM must confirm test results for the following test cases. For the purpose of this document a TMS is a software instance that mitigates threats in a network. It may act as both a Producer and Respondent some test cases. The Respondent TMS primarily reports Indicators. The Producer TMS primarily reports Sightings. Any instance being qualified as a TMS must confirm test results for the following test cases. For the purpose of this document a TDS detects threats in a network without necessarily mitigating the threat. It may act as both a Producer and Respondent depending on the type of test case. The Respondent is primarily concerned with Indicators. The Producer role is primarily concerned with Sightings. Any instance being qualified as a TDS must confirm test results for the following test cases. For the purpose of this document, a (TIS) is a software instance that consumes STIX 2.0 content in order to perform translations to domain specific formats. Those translations are consumable by enforcement and/or detection systems that do not natively support STIX 2.0. These TIS consumers may or may not have the capability of reporting sightings. A (TIS) that consumes STIX content will typically consume indicators. Any software instance being qualified as a (TIS) must confirm test results for the following test cases. Jane Ginn, Cyber Threat Intelligence Network, Inc.